Welcome to my Metro project! This car was on it's way to the crusher after it's diagnosis of engine repairs needed and other issues the car had from being neglected by the former owner. I don't know what reasoning there is behind this, but I just had to have this car and save her from becoming scrap metal. I knew she had great potential so I decided to rebuild her and bring her back to life again. I decided to start my very own thread on the progress of what I have done to save fuel with an already fuel efficient car. So far, I have increased fuel mileage on this car from 37 MPG to a whopping 54 MPG and will get even more miles per gallon after more repairs and mods are done. I have lots of pictures, so I will be updating this as I get those pics hosted and do a "Start to Finish" thread here. To get the most MPG, one must start with a properly running engine. 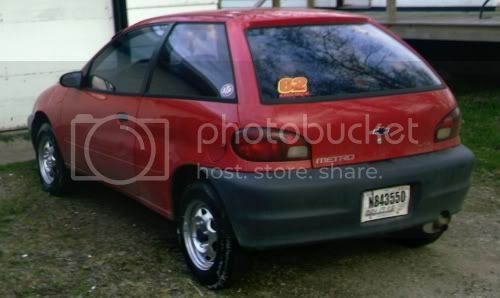 This is a 1998 Chevy Metro 1.0L 5 speed base model. First off, I got the car for almost nothing ($75.00) because of no compression in Cylinder #1 so I did my research and found it needed new exhaust valves. This means the head needs pulled to see the problem. First thing is to take pictures of all the vacuum lines and hoses so when you get to putting it together, you have a reference point. The most common issue with these 3 Cylinder engines for a dead cylinder in burnt exhaust valves from either timing or clogged EGR ports or other issues. This guide can be used for all 3 Cylinder Suzuki engines. Get the car in a suitable work area. Set engine so Cyl #1 is at top dead center (TDC). Check and correct timing marks and note rotation. Look on cylinder head for the small oil check valve and don't loose it! Place head in a clean work area with lots of room to work. Put rags in cylinder holes and clean mating surface on head, pistons & exhaust manifold. Clean head surface and clean out the EGR port. Remove EGR valve and clean all ports. Remove the lifters put in order. Clean surfaces and lap in all the valves (intake & exhaust) with lapping compound and re-install. Double check all of your work and gasket mating surfaces. Get your buddy to help you re-install the head and double check all connections! Torque all 8 head bolts to specs and order with info from manual. Install a new timing belt (or used one like a dummy) and check timing marks. Re-assemble the same way you took it apart and please double check vacuum lines since there is a lot of them. Clear all DTC if you forgot to disconnect battery. Fill oil and coolant and fire it up! Now you may have to set the timing, so reference your manual! Let the car get to operating temperature and check for leaks and burp the coolant. Test drive and watch the coolant temp since an air pocket may occur. Sorry about the quality of those pics, but the lighting was real bad and my helper taking pictures must of been having the beer shakes going on. More updating to come. Total Labor time = 7.0 HRS which was my time. Last edited by Johnny Mullet; 09-01-2008 at 12:45 PM..
cool, lots of pics is always helpful,,,, wait where is the other half of the engine? Awesome attention to detail - you don't see many guys walking you through the process, and tell you what size socket you're going to need next. My very first "Aeromod" was actually removing dents. A dented body surface can disrupt air flow and these Metro car bodies dent very easily. Not only that, it makes a crappy car look even crappier I actually added my very own dent when I got mad at the car for breaking down and I decided to make things right. There were actually dents on every body panel on this car except the hood and roof when I got it. and I got all of them out using my bare hands on the insides of the panels. 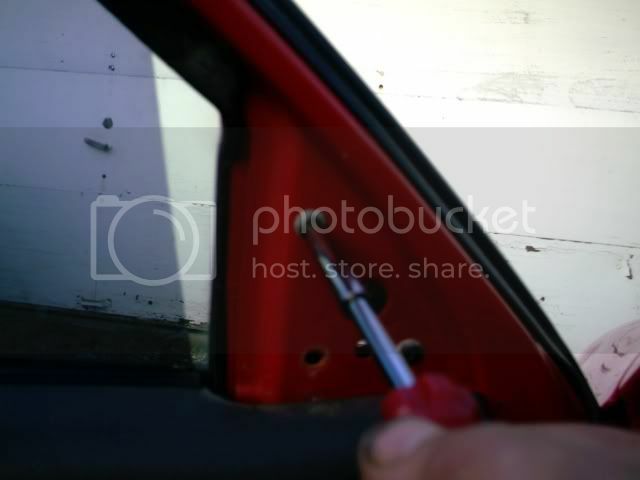 First thing to do is to access the inside of the panel by opening the rear hatch and removing the side panel by taking out the screws and pulling it out and up. Next, I felt where the dent was and popped it out from the inside. If there is a crease or dimple after popping it out, you may have to use body panel tools or do like I did and grab a kitchen spoon! Inspect your work and make adjustments where needed. 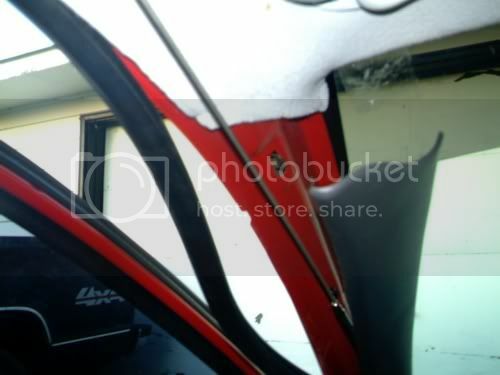 I find you can get to the inner door simply by removing the door panel, the front fenders are easily accessed removing screws from the inner fender in the wheel well. Total labor time was about 2 hours. Last edited by Johnny Mullet; 07-21-2008 at 07:39 PM.. These mods and changes got me to the 50 MPG mark. Last edited by Johnny Mullet; 07-21-2008 at 07:42 PM..
Have you tried using much pulse and glide? That should really kick your numbers up there. If you would rather remove it normally, Pop off the inside cover and remove the 3 screws instead. This is actually a pic of the left side. A deer removed that one for me, but only left a minor dent. Now to make the cover for the area the mirror was. I used a piece of a stiff, plastic mudflap found at any truck stop. I had a small piece left over from the fender skirt future project which will be posted on this thread at a later time. I traced out and estimated the size with the old mirror and used a pocket knife to lightly scribe my mark. Using a regular circular saw, I cut the needed piece and then shaved off the edges from burrs with the pocket knife. The material this flap is made of is a stiff, yet slightly flexible plastic and holding the contour or slight bend is acheived by pre-bending it with your hands slightly and holding it for a minute. I then used Black Silicone RTV and carefully put a bead around the inside edge and set in place. After a few moments of holding the cover in place, I ran a bead around the outside perimeter and used my silicone skillz and my lucky finger to perfectly seal the entire piece. The most important part of this is to let the silicone cure overnight. This ensures it stays in place and after the silicone if cured, it is slightly flexible to allow for any movement from temperature changes, highway speeds, shopping carts, curious kids, etc. Last edited by Johnny Mullet; 07-21-2008 at 07:44 PM.. Transmission is being replaced. It made a grinding noise when I got it and just simply got worse as I drove it. It was so bad, it was slowing the car down. Car has been down for a few days, but I yanked it out last night and took pictures of the process while removing it. Later I will post a complete illustrated guide on how to remove a 5 speed manual from a 1.0L Suzuki engine and the clutch replacement will also be included. Here is my transmission and clutch removal guide for you to enjoy. Make sure you are working on a clean, concrete surface since you will be lying directly on your back with no room for a creeper unless you are an anorexic. First thing you need to do is jack up the driver side front until the tire is at least 4" off the ground and place a jack-stand securely under the frame. Give it a good shakin' (without denting the body -lol-) to make sure the car is safe because you will be directly under the car and nobody wants to die unless you think you can bench-press a Metro. Now you are done under the hood for now. Next thing is to get to the axle shaft removal. Use a chisel to spread the pinch area and pound down on the control area to separate. Now it is time to get under the car and here is where all the fun starts. First thing is to place a floor jack with a block of wood under the oil pan to support the engine. If you are lucky enough to have an engine sling, then use it. Jack the engine/trans assembly up slightly to take tension off the mounts. Directly behind the trans under the car, you will find the shift rod linkage and the brace. These may look like ordinary bolts and nuts, but I found out removing these were actually the hardest part of the entire job! These are actually pins going through a bushing and if they are seized up, use lots of penetrating oil and strike the housing part (eye) many times with a hammer to break up the rust. The shift rod link a double joint (not the kind you roll) and you can take it off from either location. Heat is not recommended and don't even try whacking the threaded side with a hammer unless you have a nut on it flush. After getting this far, it's time for a short break to collect your senses and thoughts so you don't screw up. Last edited by Johnny Mullet; 06-11-2008 at 09:25 PM..